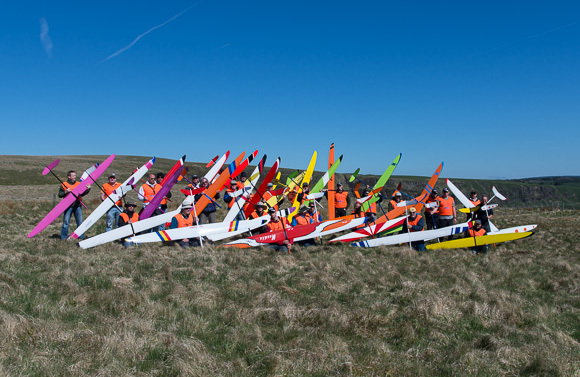 We had it all with the Nats - great weather on both days, a fine turnout and (mostly) fast conditions off the Wrecker. And for a bit of entertainment afterwards, we found ourselves on the route of a charity ride with hundreds of cyclists panting past our parking area. The only fly in the ointment was the wind which shifted East during Sunday afternoon. A round was lost and the competition was eventually abandoned as it was too late to move to the Crest. Also there were a few damaged models. I'll spare you a detailed account, as Martin Newnham already has a splendid report on his blog. Just a few of my own thoughts, or you can skip them and go straight to the photos. It was noticeable that in the climbout, most flyers are now actively 'pumping' for height rather than just thermal seeking.